Heketi is a technology preview feature. Technology preview features are not fully supported under Red Hat subscription level agreements (SLAs), may not be functionally complete, and are not intended for production use. However, these features provide early access to upcoming product innovations, enabling customers to test functionality and provide feedback during the development process. As Red Hat considers making future iterations of technology preview features generally available, we will provide commercially reasonable support to resolve any reported issues that customers experience when using these features. Heketi provides a RESTful management interface which can be used to manage the lifecycle of Red Hat Gluster Storage volumes. With Heketi, cloud services like OpenStack Manila, Kubernetes, and OpenShift can dynamically provision Red Hat Gluster Storage volumes with any of the supported durability types. Heketi will automatically determine the location for bricks across the cluster, making sure to place bricks and its replicas across different failure domains. Heketi also supports any number of Red Hat Gluster Storage clusters, allowing cloud services to provide network file storage without being limited to a single Red Hat Gluster Storage cluster. With Heketi, the administrator no longer manages or configures bricks, disks, or trusted storage pools. Heketi service will manage all hardware for the administrator, enabling it to allocate storage on demand. Any disks registered with Heketi must be provided in raw format, which will then be managed by it using LVM on the disks provided. Heketi can be configured and executed using the CLI or the API. The sections ahead describe configuring Heketi using the CLI. For more information regarding the Heketi API, see Heketi API. SSH user and public key must be setup on the node. SSH user must have password-less sudo. Start the glusterd service after Red Hat Gluster Storage is installed. Disks registered with Heketi must be in the raw format. For more information about subscribing to the required channels and installing Red Hat Gluster Storage, see the Red Hat Gluster Storage Installation Guide. The location for the private SSH key that is created must be set in the keyfile setting of the configuration file, and the key should be readable by the heketi user. The following configuration options should only be set on advanced configurations. The database will be installed in /var/lib/heketi. Setting up the topology allows Heketi to determine which nodes, disks, and clusters to use. You have to determine the node failure domains and clusters of nodes. Failure domains is a value given to a set of nodes which share the same switch, power supply, or anything else that would cause them to fail at the same time. Heketi uses this information to make sure that replicas are created across failure domains, thus providing cloud services volumes which are resilient to both data unavailability and data loss. You have to determine which nodes would constitute a cluster. 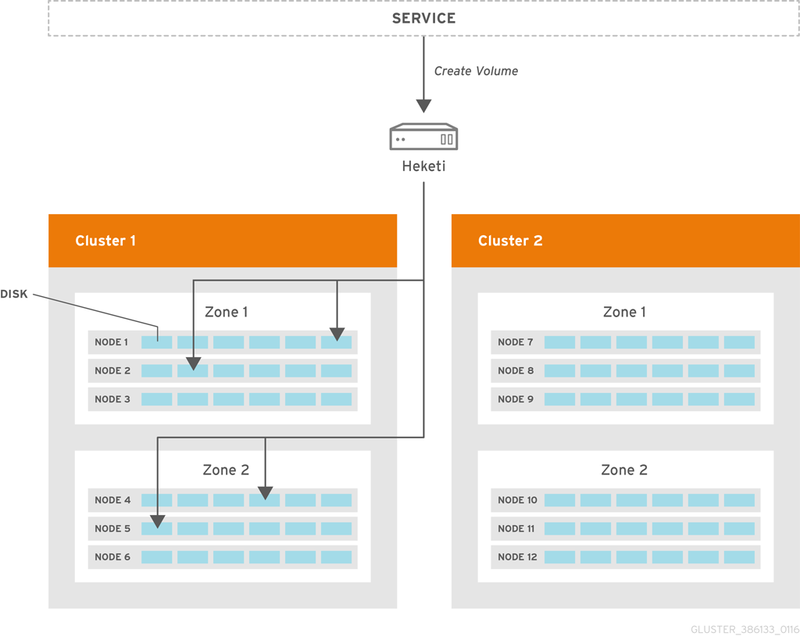 Heketi supports multiple Red Hat Gluster Storage clusters, which gives cloud services the option of specifying a set of clusters where a volume must be created. This provides cloud services and administrators the option of creating SSD, SAS, SATA, or any other type of cluster which provide a specific quality of service to users. node: map, Same map as Node Add except there is no need to supply the cluster id. After Heketi is set up, you can use the CLI to create a volume.